Lemon flavoured anything is always a hit with me. 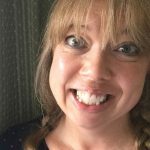 And judging by the number of page views and pins, it is the same with my readers too. Having made a delicious, gluten free lemon cake for friends, a lemon hit was needed here at home too. 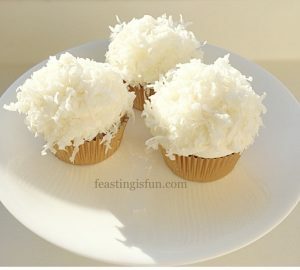 Since I very rarely make the same cake twice, adding shredded, sweetened coconut seemed like a good idea. Good it wasn’t, fantastic it was. So welcome to my Lemon Coconut Sponge Layer Cake. 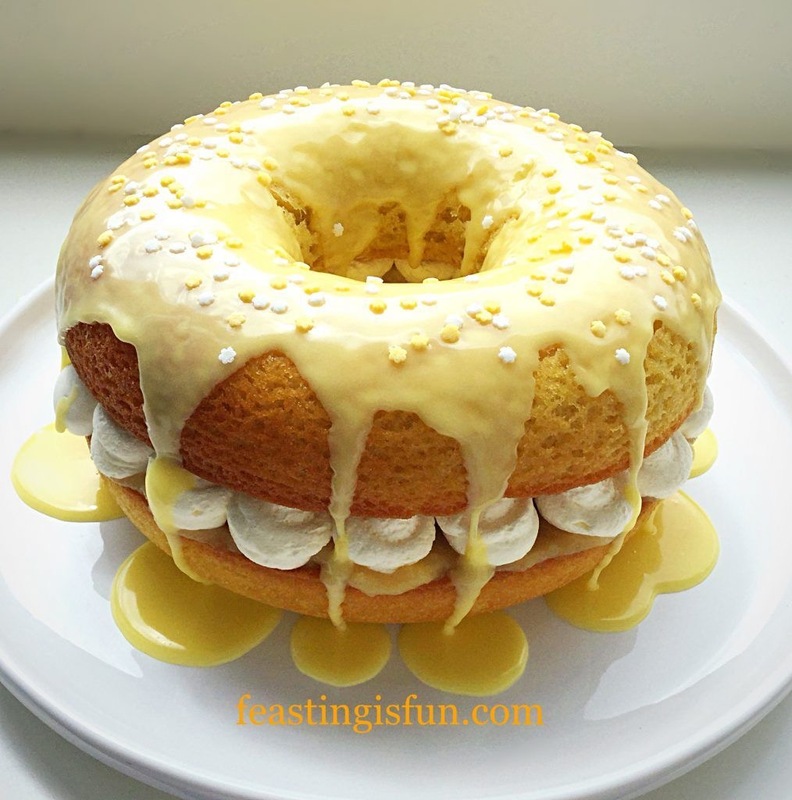 Light, golden, lightly flavoured sponges sandwiched together with tart lemon curd and creamy, lemon buttercream. 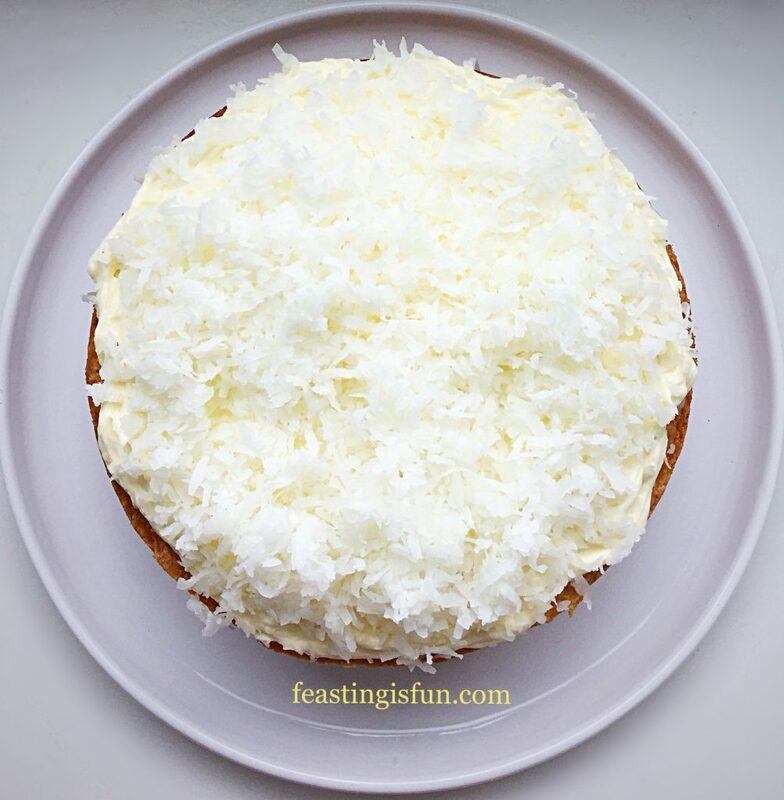 Additionally, topped with more buttercream and sprinkled with coconut, this cake is a flavour feast in every bite. While the coconut is ordered from Amazon UK, it is never a faff. The moist, sweet bite of every single strand is worth the small extra effort. 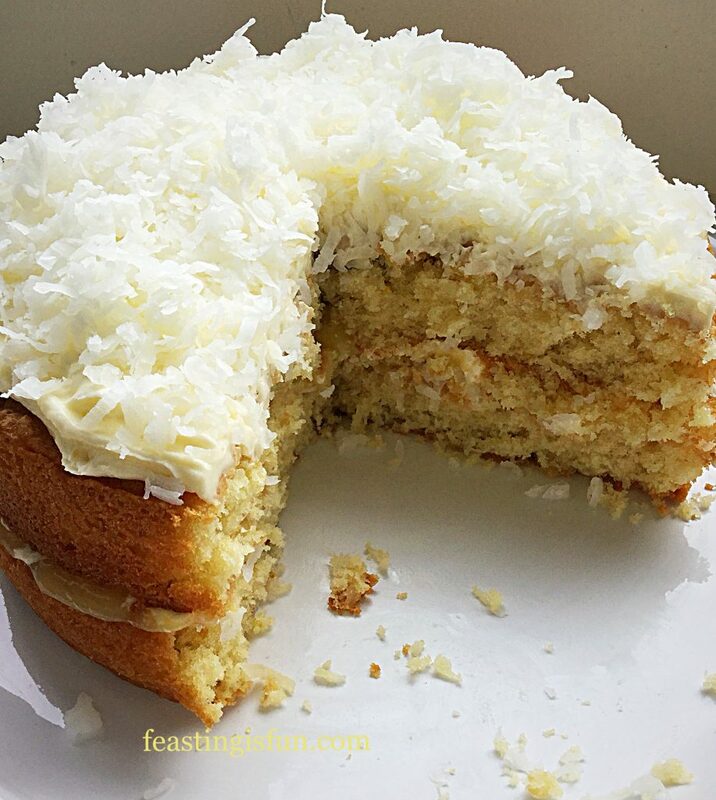 Alternatively you can, if you must, make this cake using dessicated coconut. 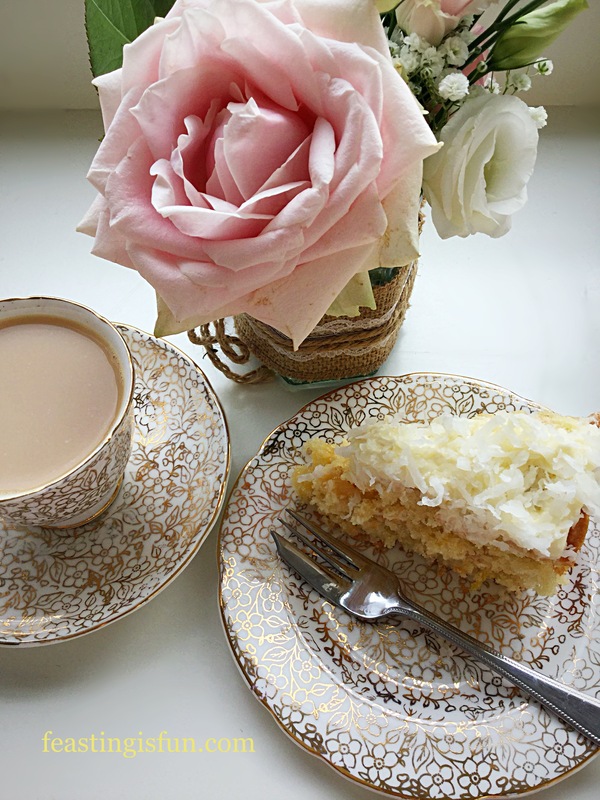 Lemon Coconut Sponge Layer Cake served with Afternoon Tea. While the photograph above shows a slender slice of cake, know that this is near impossible to achieve. And so it should be! Photographic aesthetics aside, please do cut a decent portion when serving. Otherwise you and your guests will be left longing for another slice, or two, such is the more-ish-ness of this sweet treat. Enjoy the satisfaction of not only seeing a decent slice of cake on your plate, but also from eating it. Lemon Coconut Sponge Layer Cake sandwiched with tart lemon curd and creamy buttercream. Cake is not something that most people eat everyday. Although I cannot think of a single reason why it shouldn’t be, considering the consumption of biscuits and chocolate, we as a population eat our way through. Rather, cake and the eating of it, is a celebration. Perhaps of the moment, days gone by, or memories brought to mind. Eating cake, in itself is a feast. And a feast should never be eaten half heartedly. Butter and line with baking parchment, two 20cm/8″ round sandwich tins. First of all, place the butter, caster sugar and salt into a large bowl. Whisk until pale and creamy. Next add all 4 eggs and the zest of two lemons. Sift the flour and baking powder into the same bowl. Now add the sweetened, shredded coconut. Whisk briefly until everything is fully combined. Divide the cake batter evenly between the 2 sandwich tins. Smooth the surface of the batter with a spoon. Place the tins into the centre and lower parts of the oven and bake for 35-45 minutes. The cakes are baked once they have turned golden brown and spring back from a light touch. 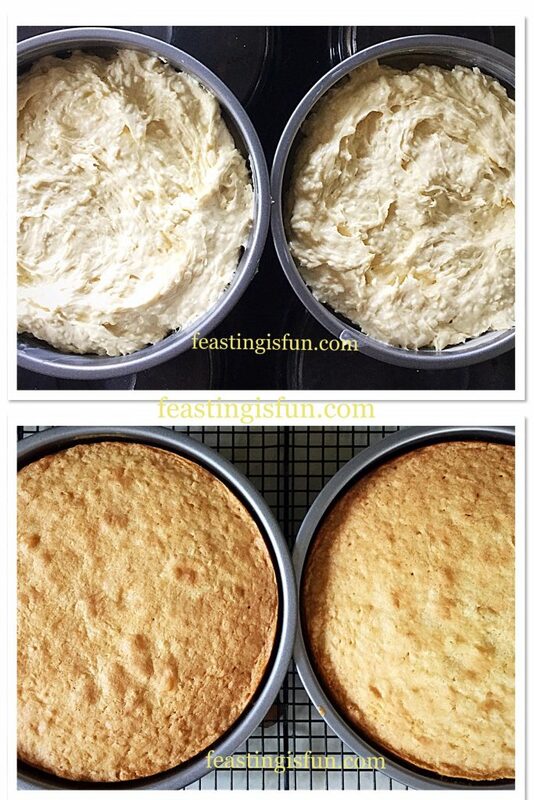 As soon as they are baked, remove the cakes from the oven and allow to cool in the tin for 10 minutes. Filling the tins and cooling the baked cakes. After cooling in the tin for 10 minutes, turn the cakes out on to a cooling rack. Carefully remove the baking parchment from the base of each cake. Set the cakes aside to cool completely. While the cakes are cooling make the buttercream. Add the butter, hot water, icing sugar and lemon extract to a large bowl. Starting on a slow speed whisk the ingredients together, increasing the speed until the mixture is very light and creamy. For ease of decorating, fill a piping bag, without a nozzle fitted, with the lemon buttercream. To fill and decorate the cake ensure it is fully cooled before starting. Place the bottom sponge flat side up, on to a plate or board. Spoon over the lemon curd and spread to cover the cake just inside the edge. Tun the top sponge so that it is flat side up. Pipe half of the buttercream in a swirl on to the cake. 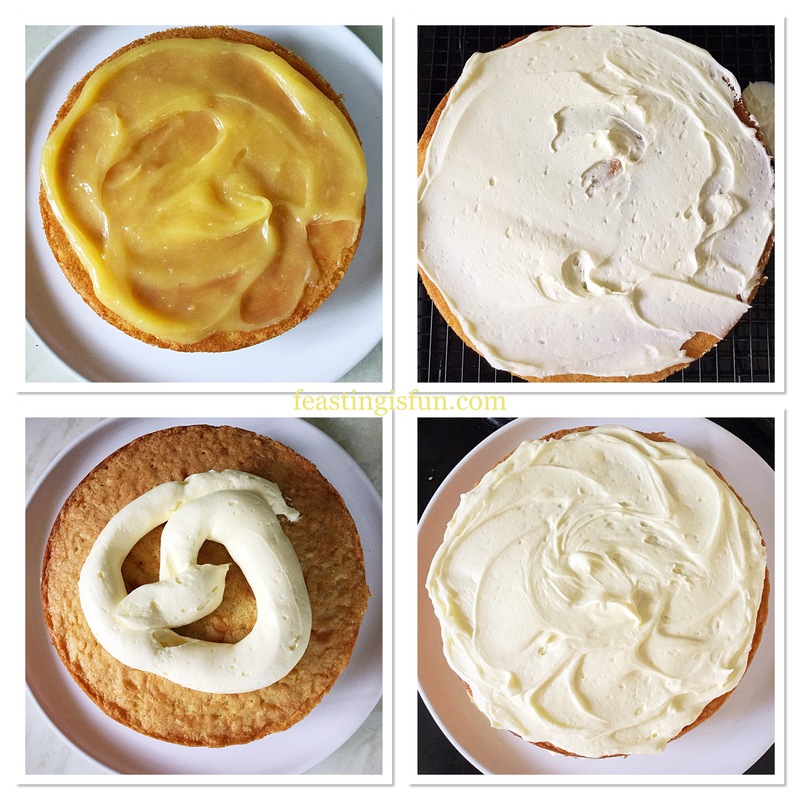 Spread so that the buttercream covers the cake, similar to the lemon curd. Turn the top sponge over and gently place on top of the lemon curd covered bottom Sponge. Pipe the remaining buttercream on to the top of the cake and spread evenly, so that the top of the cake is covered. Filling, assembling and covering the cake. 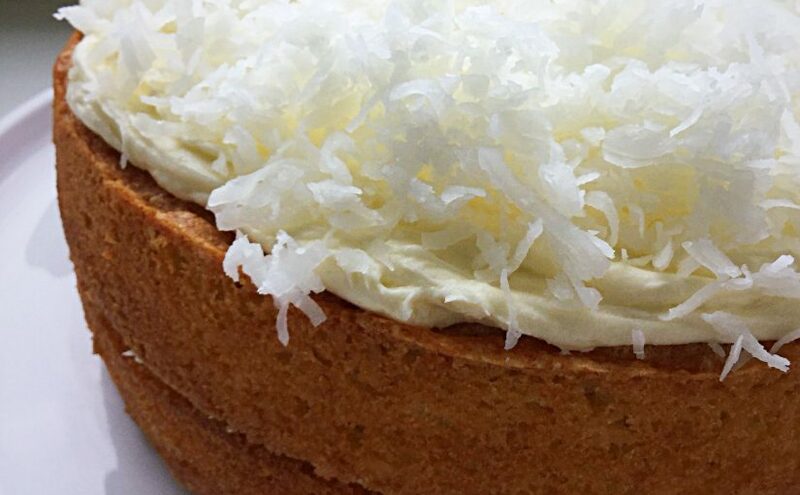 Finally sprinkle over the sweetened, shredded coconut, so that it evenly covers the top of the cake. Lemon Coconut Sponge Layer Cake ready to serve. Serve generously sliced, to friends, family and neighbours. Likewise, include a fork as this cake is delectably soft, more so on the day of making. 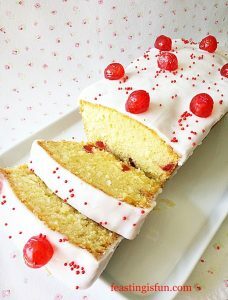 If you know someone who loves the combination of lemon and coconut, why not bake them a cake as a surprise. Store this cake in an airtight container for up to 5 days. Refrigerate during warm weather. 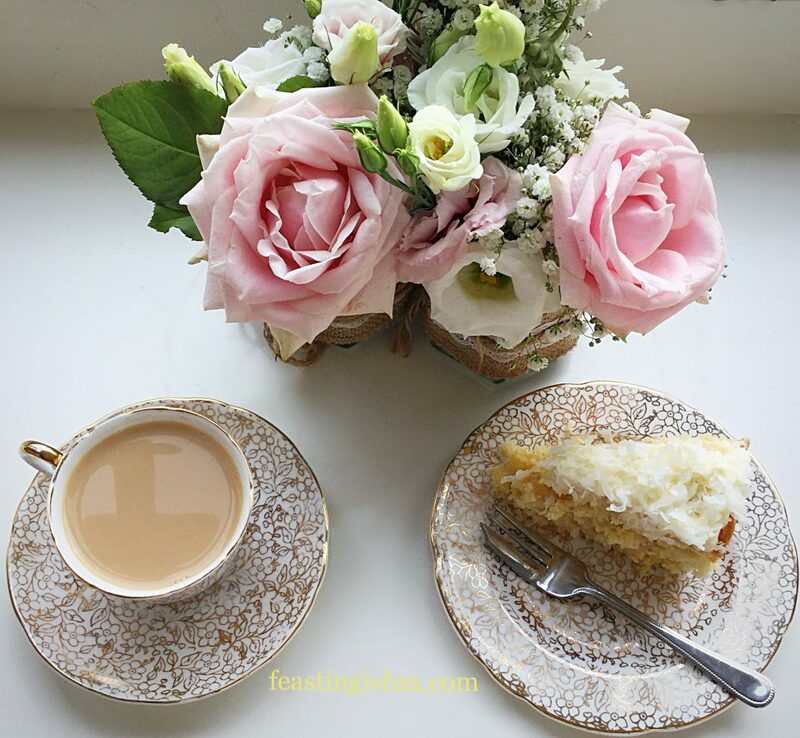 Lemon Coconut Sponge Layer Cake served with Tea. 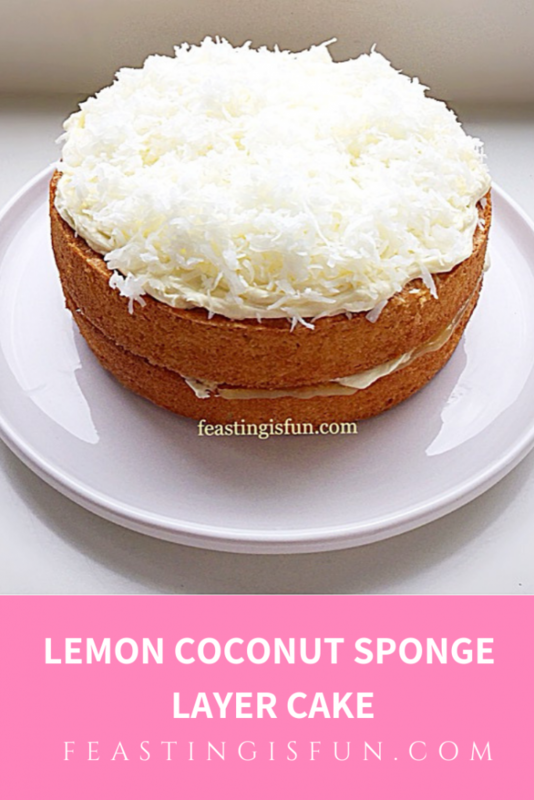 Finally, should you want to indulge your love of lemon recipes further, why not visit Pinterest at Sammie | Feasting Is Fun? All of my recipes are easy to find on one board and I also have one board dedicated to Lemon Love. Whether sweet or savoury, lemon is an ingredient I am never without in my kitchen. From coleslaw to cakes, there are a myriad of recipes using lemon to inspire you. No part of this post may be reproduced or replicated without the written consent of the owner. Please see my Disclosure Policy. This looks absolutely incredible and extremely delicious! The pictures are fantastic as well! Wow, looks incredible! That shredded coconut is going on my shopping list! Your cake looks so beautifully light and fluffy! I always think I’m not that big a fan of coconut, but then I see a cake like that and instantly change my mind. Shredded coconut always looks so pretty on top of a cake.